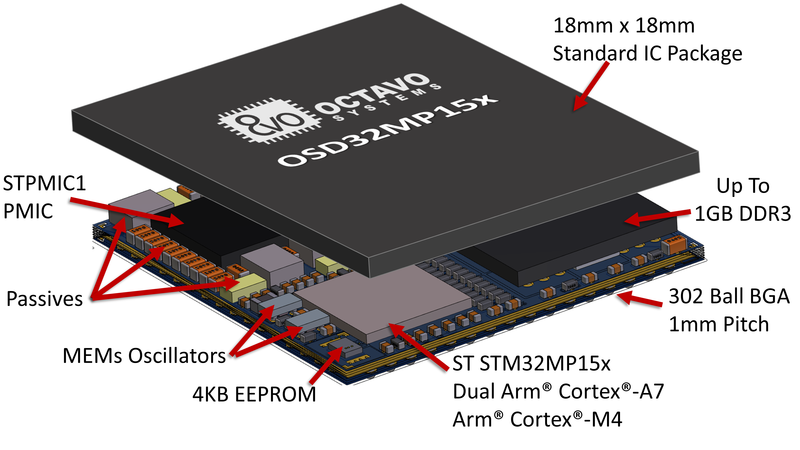 Octavo Systems introduced the OSD32MP1, their first System-in-Package (SiP) product based on the new STM32MP1 microprocessor from STMicroelectronics. The OSD32MP1 allows users of the popular STM32 family to move to Linux without adding size or complexity to their design. 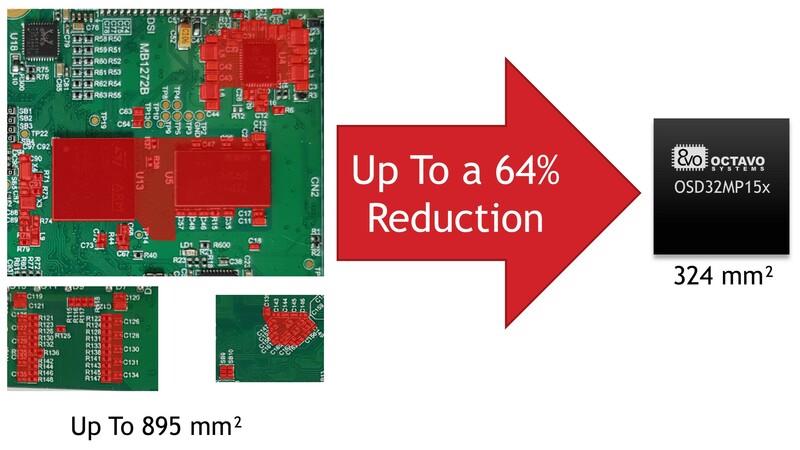 Octavo has leveraged their years of experience creating tightly integrated system building blocks to develop a device that is up to 64% smaller than an equivalent system made from discrete components. 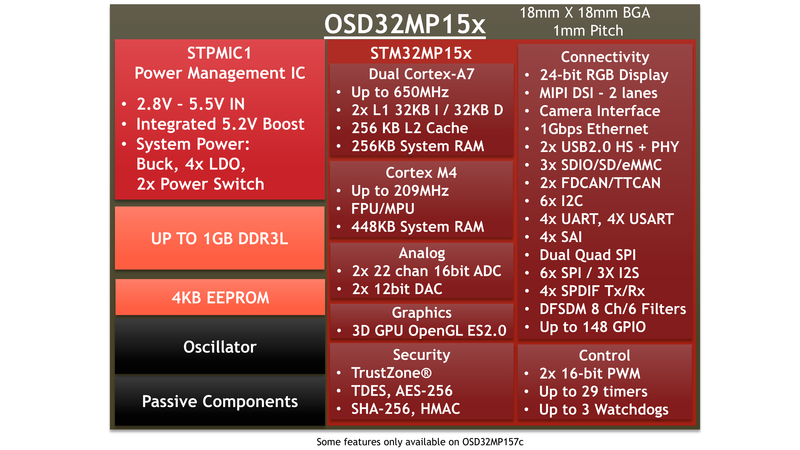 At only 18mm X 18mm the OSD32MP1 is the same size as the STM32MP1 but integrates the STM32MP1 microprocessor, STPMIC1 Power Management IC (PMIC), Up to 1GB of DDR3 memory, 4K non-volatile EEPROM, MEMs oscillators, and over 100 passives into a single BGA package. The new STM32MP1 contains Dual Arm® Cortex®-A7 microprocessors along with an Arm® Cortex®-M4 microcontroller. It has a wide range of peripherals spanning from two 22 Channel ADCs, to a camera interface, to 1Gbps ethernet, to a 3D GPU, making it a great fit for remote sensors, HMI displays, motor control applications, medical systems, and IoT end points. The integration provided by the OSD32MP1 SiP makes the solution ideal for any application needing a versatile applications processor in a small package. The STM32MP1 builds on the success of the STM32 line of microcontrollers by leveraging the STM32 Cube Environment. The inclusion of the M4 allows full re-use of the STM32 MCU Cube Firmware while adding support for Linux. The OSD32MP1 integration allows users to take advantage of a full microprocessor without the increase in complexity that typically comes from routing DDR and complex power management. The ability to re-use firmware and the elimination of complexity makes the OSD32MP1 the easiest path for designers to move from a microcontroller to Linux. Beyond simplifying the design process, the OSD32MP1 brings all the other benefits of System-in-Package to this new set of designs. These benefits include lower cost Printed Circuit Boards (PCBs) by requiring less space and needing less complicated manufacturing processes, like Laser Vias or Via-in-Pad. The OSD32MP1 also simplifies the task of sourcing components by integrating over 100 devices from multiple vendors into a single component. Design resources for the OSD32MP1 are available on the Octavo Systems website. Samples will be available in Q3 with full production scheduled for Q4. “Pricing is still being finalized and will be in-line with the cost of an equivalent system designed with discrete components,” said Greg. To further help customers start developing with the OSD32MP1 Octavo Systems is proud to announce ISMOsys (Integrated Sales Marketing and Operations) as its official pan European Representative. ISMOsys delivers true local technical specialist from seven regionally based offices. You can find your local contact at https://octavosystems.com/contact/sales-contacts/ or www.ismosys.com/ismosys-emea.